Muškovci - Beautiful excursion on the Zrmanja River - Explore Croatia Become a Patron! Muškovci is a beautiful excursion on the fascinating Zrmanja River, an alternative to the crowded sea coast of the Adriatic and opportunity to discover striking landscapes of the waterfalls in a deep canyon. Enjoy the refreshing and clear freshwater, jumping from the waterfalls, enjoying the Jacuzzi, swimming and relaxing in a wild, yet adorable environment. The Zrmanja River is one of the most beautiful Croatian Rivers, located in Zadar hinterland. 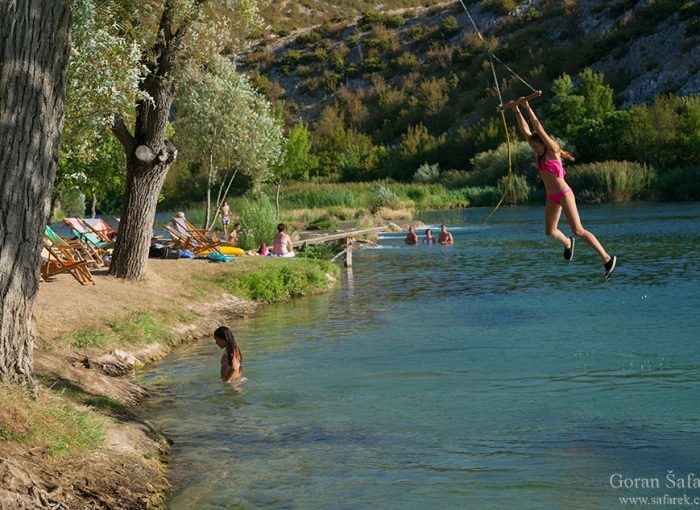 It is an oasis in the barren rocky plateau, deep in the wild canyon, below magnificent Velebit range. The sight of the fresh water in such unhospitable environment is unbelievably alluring. The rapids and cascades draw rafters and canoeists in a adrenalin refreshment on a striking landscape. At the end of the canyon and rafting route is Muškovci. This used to be just a few houses in a scattered village, but now, it has become one of the great excursions. And it is not developed like on the coast. The bars, restaurants and almost wild camps have kept its wild appearance. There is a beautiful waterfall made from tufa (Learn what tufa waterfalls are), where you can discover every nook and cranny. Or you can just rest and enjoy natural Jacuzzi on a cascade. Then jump from the falls to the emerald green river, safe enough for everybody who can swim. Or you can swing and jump from the rope attached to a tree, in all imaginable ways, just take a look to local boys. After a energy consuming activities, you can refill your calories in a restaurants overhanging the water, near the old watermill or just sip the drinks in one of the bars. And then relax and sunbath. Turn from the Obrovac – Gračac road to Muškovci sign. Little bit upstream is Ogar waterfall, whereit is possible to swim and jump too.